Micromax is soon going to add a superb edition in its Micromax mobiles collection named Micromax Canvas 4. The manufacturing company launched predecessor of this amazing widget couple of months back named Micromax Canvas 3D and till date it is hitting the market with high sales. Micromax is one of the developed and growing smartphone brand in India and they are growing their collection day by day by watching the growing concern of mobile environment. The smart widget is also equipped with good quality front facing camera that is of 3.2 megapixels for doing clear video calls. Media players are also available in this device for accessing the multimedia files saved in this smartphone. The device runs on Android 4.1.2 Jelly Bean operating system. The device comes with 8GB on board storage, which can be further expanded up to 32GB via microSD memory card. The device also offers dual-SIM capability, both the SIM cards will run on 2G and 3G network. The device is embedded with 3000 mAh Li-Ion battery that gives a talk time of about 15 hours and standby time of about 6 days. The device contains 4 GB of ROM space and 2GB of RAM space allotted to the users. Micromax Canvas 4 features a 5.5 inch TFT capacitive display screen which is capable of delivering a smart resolution of 1920 x 1080 pixels to the users. The smart widget takes care of users music needs as the device also comes with FM radio as well as a music player that supports multiple formats. The device is powered with quad-core Cortex A7 processor clocked at 2GHz mobile processor. The phablet category mobile phone is also equipped with PowerVR Series 5XT graphics. The connectivity options supported by the device includes GPRS, Bluetooth, Wi-Fi, USB 2.0 port and a 3.5 mm audio jack. The device offers a 13 megapixels camera for capturing images and videos which is more than its old version Mircomax Canvas HD 8 MP and Canvas 4 have a Additional features like flash and digital zoom, add-ons like autofocus, face and smile detection and image stabilization are also available in this device. Apart from this awesome specification and features the phone is predecessor of Micromax Canvas HD and the Micromax Canvas 4 pictures shows that this device is quite a catchy device by looks and design. 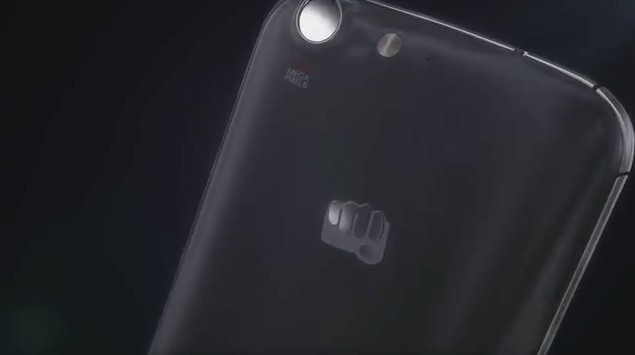 Micromax Canvas 4 price is not yet confirmed by the company but expected that the company will tag with Rs 18,000, which is quite a good buy price because specifications are not less than high end mobiles. The device also comes with Hookup Instant messaging app. The mobile phone also offers some extra features like Proximity Sensor, Accelerometer, and Ambient Light Sensor are also included, along with a Loudspeaker.